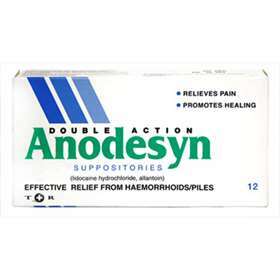 Double Action Anodesyn Suppositories 12 containing Lidocaine Hydrochloride and Allantion for effective relief from haemorrhoids/piles. Suppositories that contain lidocaine, a local anaesthetic, to relieve pain and soothe itching. The allantoin helps to promote healing in the affected area. Adults and children over 12 years old; insert one suppository at night and one in the morning, after emptying the bowels. Wash your hands thoroughly before and after use. If necessary, empty the bowels before use. Remove the protective film before use. Not suitable for children under 12 years old. Seek advice from your doctor before use if pregnant or breast feeding as lidocaine can be absorbed into the body and passed on through breast milk. Please Note: The packaging has changed from 'Triple Action' to 'Double Action'. The ingredients are exactly the same as before. There have not been any changes to the formula. Lidocaine Hydrochloride 10.25mg, Allantoin 10.25mg. Also contains; colloidal silicone dioxide, witepsol and purified water.